Here is the completed easel card for the workshop/tutorial that I have been waffling on about for the last few days. 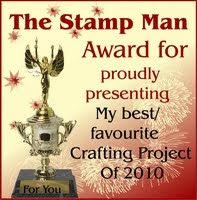 I made this card for Ian, The Stamp Man, for his birthday. the rabbit image came from a collage sheet from Elizabeth Golden. 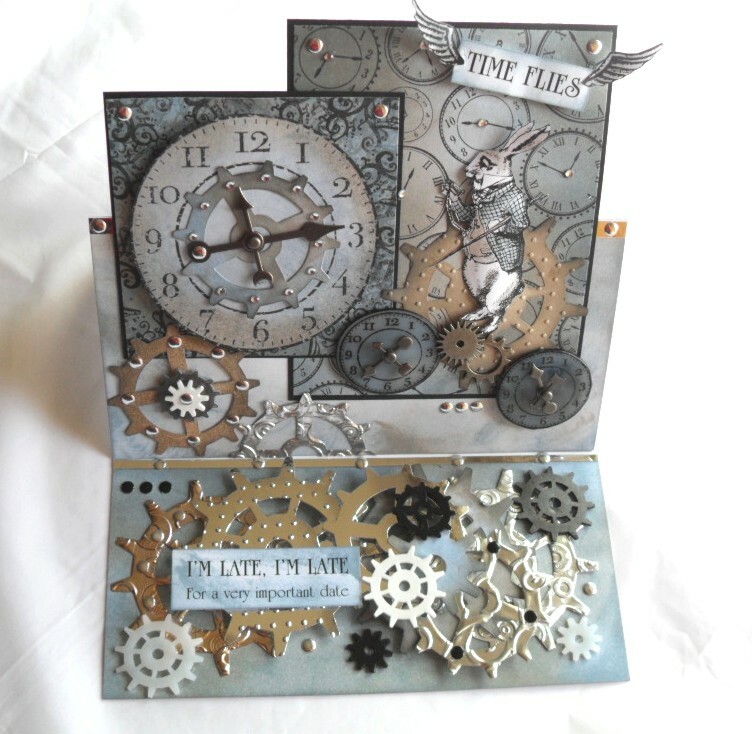 I've also used Tim's new Alteration Gadget Gears Sizzix die, the cogs/gears from Tim's Ideology, and my Cuttlebug amongst other things. If you are interested in the workshop/tutorial you'll find it all listed in the labels section on my sidebar, it has lots of waffle and plenty of photos, so you can view all the flaws in close up, lol!! I've decided to enter this into a couple of challenges, my first time of entering challenges. 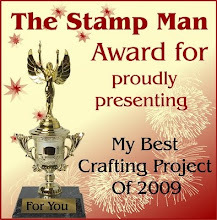 They are the Allsorts Challenge Blog, the theme being no ready made design papers and also the Simon Says Challenge which is distressed. 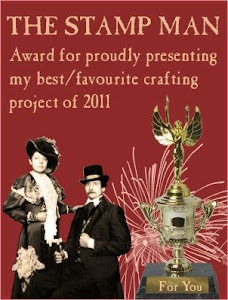 Somehow it doesn't seem right me commenting on your card - it is utterly awesome and I am such a novice in comparison (not that there is any comparison) but I thank you so much for taking on and smashing my challenge at Allsorts this week. What an absoloutely gorgeous work of art. I am so sure it will be treasured. Thanks for the fab tutorials. This is a wonderful card, the detail and arrangement is perfect. I enjoyed the tutorial lots. Beautiful card. I love all the gears, especially the silver embossed ones. I can see the gear die making it's way to my wish list. This is absolutely brilliant Jill (and reminds me I have 2 alice in wonderland art decos to make!) 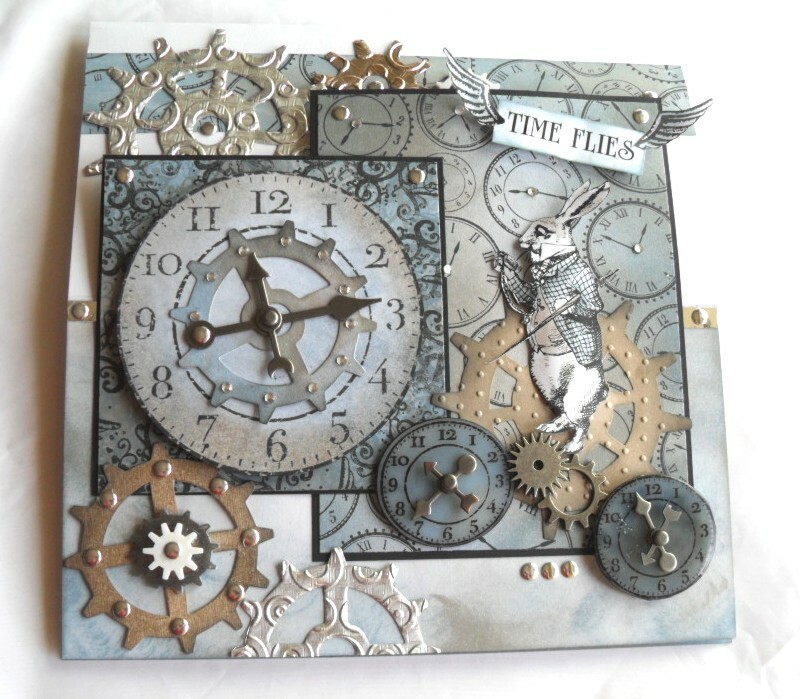 I love clocks (Its a capricorn thing!) and think you've done an amazing job with this work of art! Well done for your challenge plunge, Debbie and I must be rubbing off on you hee hee! There is only one word for this Jill and it is "WOW"
I love the cog dies just perfect for a male card and the stamped background looks so proffesional!! Outstanding work! I have done some similar time cards with the blues, golds in the past, very classy!! I'm very late getting here, but didnt want to miss the opportunty to say what a fabulous project. And of course thank you for sharing it with us at Allsorts - new challenge starts today, so hope to see you. Jill, I hope I did not deafen you when my chin dropped to the floor on seeing your card in the shop today......! Utterly amazing, exceptionally inspirational, thank you for sharing. Demonstration/Open Days - This Weekend! MORE NEW TIM STUFF is here!